We all have a few things that just work well for us. Whether that be in our training, our way of eating/nutritional needs, or even our work/life balance. We find what works, what makes us feel good, and we stick with it, well for the most part. For the past 5 months, we’ve been trying to figure out what’s working. I think I mentioned in beginning of this post that our life looks a little different these days. And that’s okay! Transitions happen. They keep us on our toes and working through rough spots. That being said, working more (job wise) and working out less can be one of the hardest transitions when you’re used to being a full time athlete (ahem, my husband, the Kiwi). I think a majority of us have been there. When life gets unintentionally busy or FULL, we do What WE Can (physically) When We Can. A walk, a quick 10 minute Circuit, yoga on our lunch break, taking the stairs, etc. In fact, the other day my husband did 150 body weight squats while getting ready for work. It’s all he had time for between coaching and his other job. The next day he was sore. I find this a wee bit comical coming from a guy who used to train 4-5 hrs a day. But hey, it’s WHAT WORKED and I feel his pain. Haha! Food is another thing we are trying to figure out. What we need to fuel us, now that there is less intense training but still a lot of activity. If that makes sense. And you know what? It all comes down to balance. Yet again! So here we are on a Monday talking about balance and bars. Not to be confused with Balance Bars. Nope, because these balanced protein bars are the real deal. They are what’s working for us. 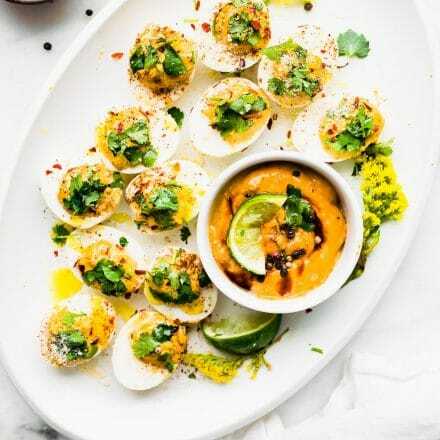 Balanced with flavor, they are easy to digest, they are made with natural sugars, healthy fats, and a complete protein. We all know protein is super important for us. Proteins contain amino acids, which are used in the body to repair cells, to make enzymes, hormones, and antibodies. There are 20 different amino acids that are contained in a protein, and nine that the body cannot make on it’s own. These are the essential amino acids, and if you have all 9 of these essential amino acids in a protein, then it’s called a complete protein. Make sense? The best sources of complete protein comes from animal meats, dairy, and egg whites. And for vegans, complete proteins can be found in quinoa, tempeh, chia, and a few other seeds/legumes. Have I bored you yet? Okay, my point here. 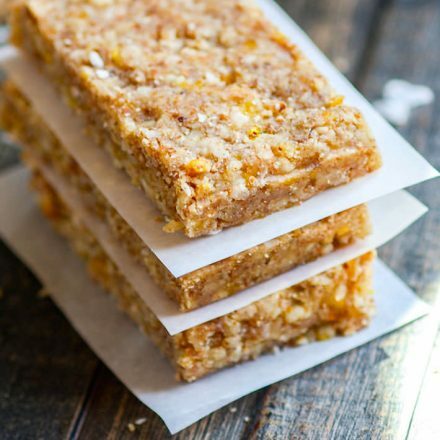 The reason why you need to make these bars is because they will sustain you for whatever you day may entail. They are a COMPLETE balance of nutrition, nutrition you NEED. They great for travel, for a pre or post workout snack, for breakfast on the go, for just getting in extra macro/micro nutrients. You see, they just WORK! Oh, and they taste pretty darn good. I told you I had a point here. 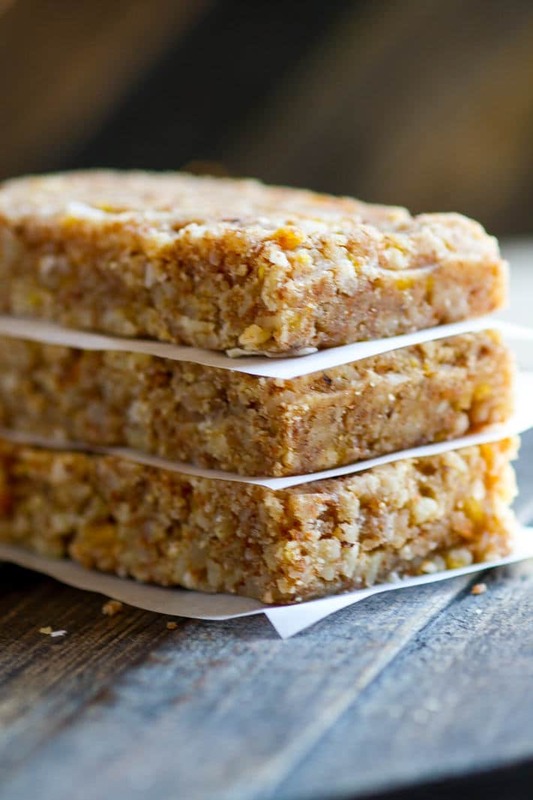 Protein Bars, Balance Bars, Fruit and Nut Bars, whatever name “works” for you. 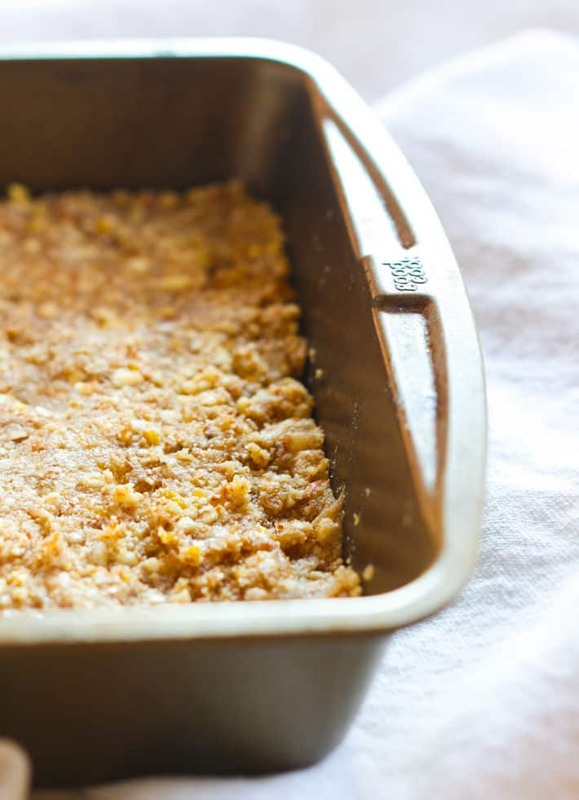 And the best part… you don’t have to turn on the oven. No baking required. All you need are a few simple ingredients and a blender/food processor. 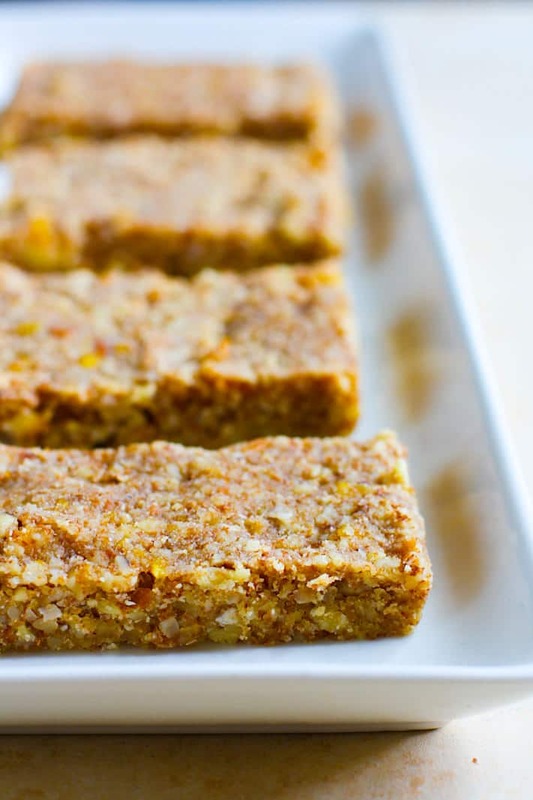 And just so you know, I made these paleo protein bars 3 times, baking until I found the best recipe that WORKS. Did I emphasize that enough already? The, um… what’s working part? Ha, I’m kidding. Sort of. First grind up your dried mango. they are usually tough so if you don’t have a high powered blender or food processor, try to cut with a knife first, then grind them. Makes anywhere between 9-12 bars. You choose size! If you can’t find egg white powder (which is usually in baking section), you can use chia flour, 100% whey protein isolate, Pea Protein, or Brown Rice Protein. But the texture and taste will be a little different, so adjust honey/water accordingly. Okay, time to celebrate Meatless Monday! What’s working Food or Fitness wise with you these days? That must be such an odd feeling for him but of course it makes sense, our bodies adapt to training or lack thereof! I’ve seen it in myself over the years. 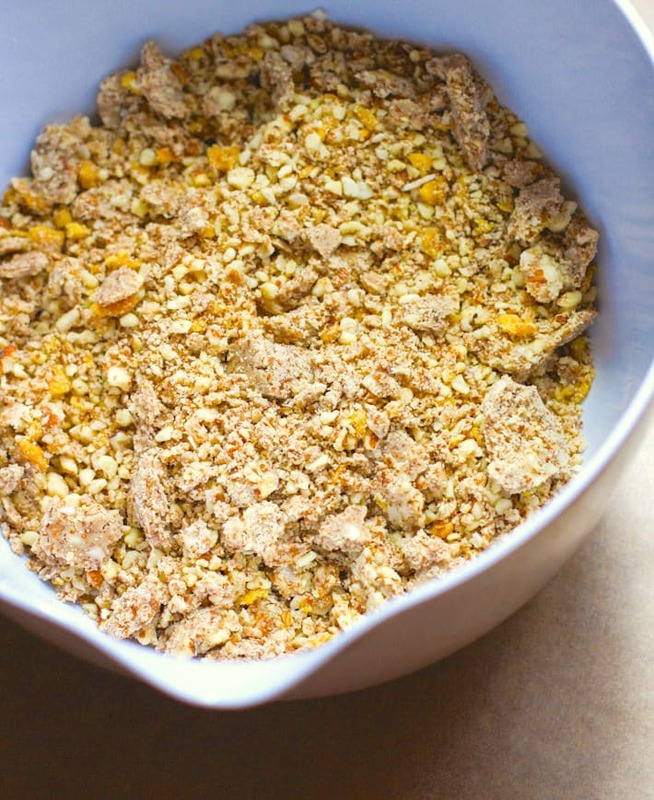 As for the recipe I think I’ll have to add it to my after school snack rotation – yum! LINDS! These sound amazing, exactly what I love to eat as a protein bar….I have one question, are they crunchy or chewy? I am gonna give them a go, oh my yum! Oh and, I am so glad to hear you are working on WYCWYC! Me too, its tough, but you feel SO much better! To be fair, you do you different muscles for body weight exercises (because of being unemcumbered by the weights), so he might have been sore regardless, but I totally understand. I can’t imagine the transition to “civilian” life for him. He must think he his loafing around, but in reality he is probably still doing way more than most people ever do! it’s been a hard transition for sure, but he really is more like a normal person. haha meaning regular fitness. 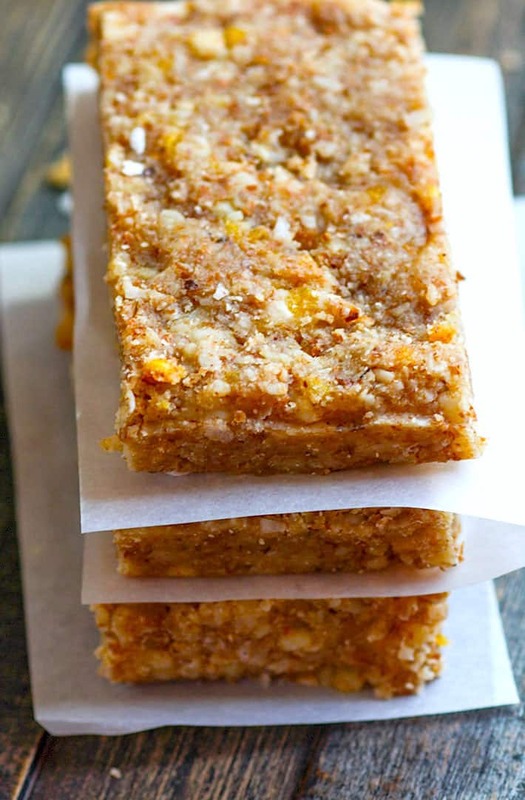 and i think these bars are more chewy but you can easily make them more crunchy. Mango and coconut is a dreamy combination! Fitness wise, my routine has changed a lot. I ended my gym membership, as I am moving soon, and have now been doing a lot of home workouts, yoga and running, which has been a nice change for the summer months. Things will continue to shift when I actually move, but I am open for change and adapting to what feels right. These look great! I have not tried much dried fruit in protein bars, other than blueberries and cranberries… I’m digging this mango! Definitely need to try it. Mango + coconut = AMAZING! Thanks for sharing this awesome recipe! Working on finding that balance right now too…Although I feel like we are always trying to find it…Let us run away for a little bit…HA! Too funny that the Kiwi was sore after those squats…Whatever works when life is busy! Perfection! I’m sure I can handle making them on crutches too. You know what does work? This post and these beautiful bars. They look amazing and I just so happen to have dried mango in the pantry. And I just stuck a batch in the fridge to harden. The sneak peek I snagged off the spoon tasted great so I know they’re going to be good. did you really? gosh i love you more for that! 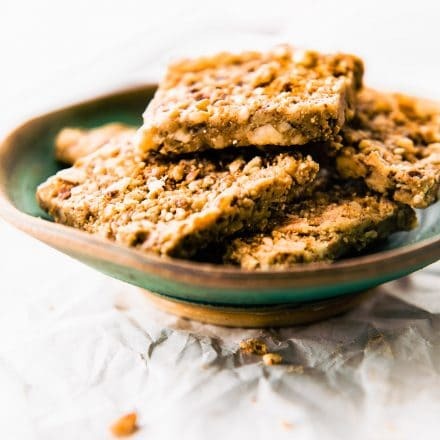 These sound so much more delicious than balance bars! I love the mango/coconut combo! I personally appreciate all your hard WORK. These looks ballin’. If there were only enough hours in a day to be in my kitchen! My oldest would love these, pinning for later! I’m going to try them with Coconut Almond Vega One protein! Oh this sounds soo yummy!! I wish Dave could have nuts, but he’s still pretty sensitive. But I think this might be ok with sunflower seeds! yes! or i’ve used pumpkin seeds before too! Yum..those bars look delicious! Fitness wise… Weights & Hot yoga! Food.. All the fat. I can’t get enough coconut oil. avocado & nuts these days. I love all the nutrition details in your posts! Complete protein is a fascinating topics for me (like all things nutrition haha). I hope you and kiwi continue to do well with the transition – you have such a wonderful attitude, of course you will! 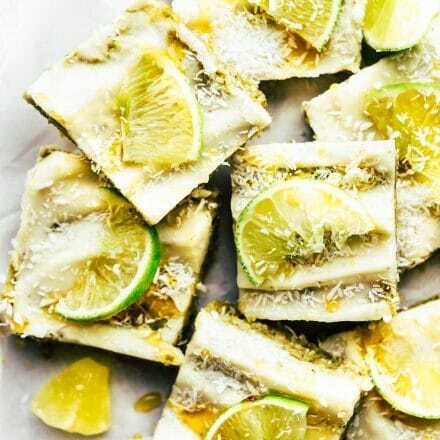 These look so tasty – so much yummier than any store-bought bars! So simple! 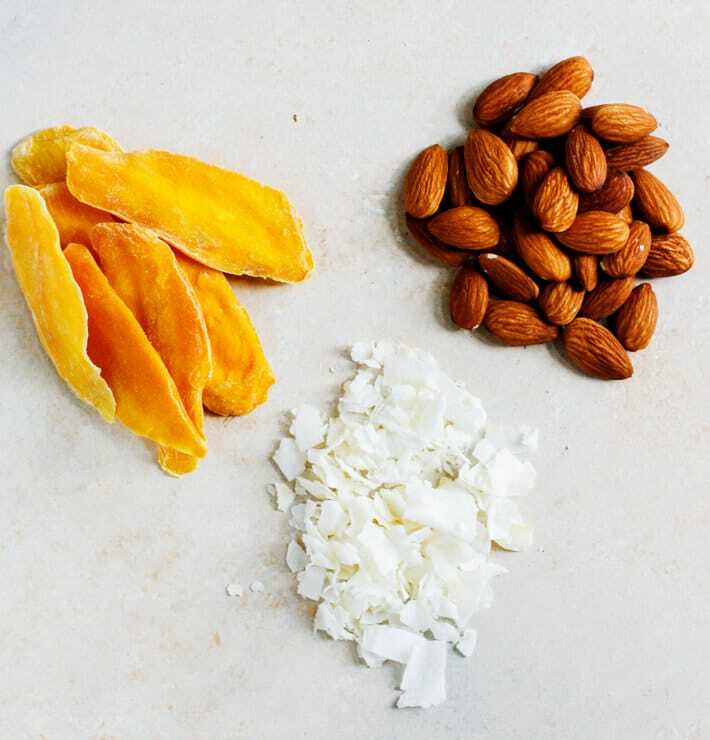 and some of my favorite ingredients 🙂 I <3 mango and coconut together – especially when it is in a yummy snack! These look amazing. The perfect on-the-go treat! My kids and I love dried Mangos- but I can’t eat them lately due to flare of TMJ — maybe these could be dunked in a glass of almond milk to make them soft??? Oh my goodness, I’m like a grandma— “let’s get her some applesauce and pureed carrots!” As someone who thinks of food as a hobby this is prison sentence! I love the flavor of mango and my boyfriend does, too. I think we would enjoy these bars, Lindsay! What a unique combination! I love it, and I can’t wait to try it! I’m kind of a texture freak, and these look like perfection to me *insert heart-eyed emoji here* And I’m -loving- the combination of flavours, too! Can I pretend that I have a plate of these in front of me? With a cup of coffee? Mm yes. you sure can! although I wish it was coffee with me now! YuM! I’ve so been there. Adjusting to a 9-5 hit me harder than I thought it would movement wise. While I love my job I do have to stare at a screen all day and it’s not the best for my health. Gah, i feel ya. but at least your doing what we love! and fabulous at it! These look fab Lindsay! Perfect for David’s packed lunch and I know he would love them! David and I are both finding the transition from Scotland to Australia tough – especially having to take a months break from crossfit (we did it week in week out for 2 years) but we try and keep going by fueling our bodies right, doing some fun hotel gym workouts and combining that with enough rest and some yoga. Next week we move into our new house and will trial out new crossfit boxes – I miss it but I know this rest has done my body the world of good during this time of stress! wish we could be resting and adjusting together! keep me posted on you and david! I’ll have to try that mango and coconut combination! thanks friend! p.s. Can’t wait to hear about your hike! 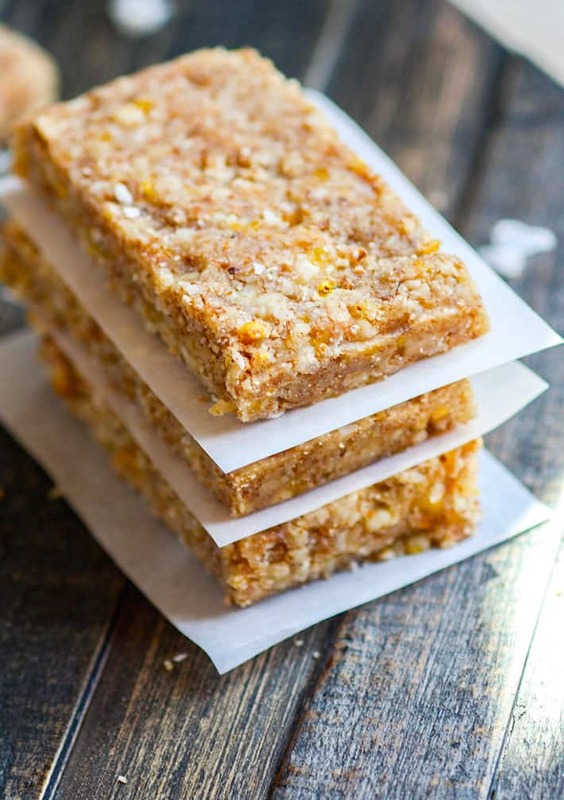 i would totally go for these protein bars right now. I don’t know how you have the time, or the creative mind, to come up with all these recipes – but I am glad you do. haha i don’t run anymore. LOL! More time. P.s 512 market made some extra sugar free healthy bites. I told them you might want to buy them. Yes? let me know if so! Haha – I like what you did here – “So here we are… talking about Balance and Bars. Not to be confused with Balance Bars” – these sound amazing, BTW. I am gonna have to get me some dried mangoes ad\nd try this for sure! On life – OPMG, I understand!!! HUGE HUGE HUGS!!!!!!!! just move here and i”ll feed you! 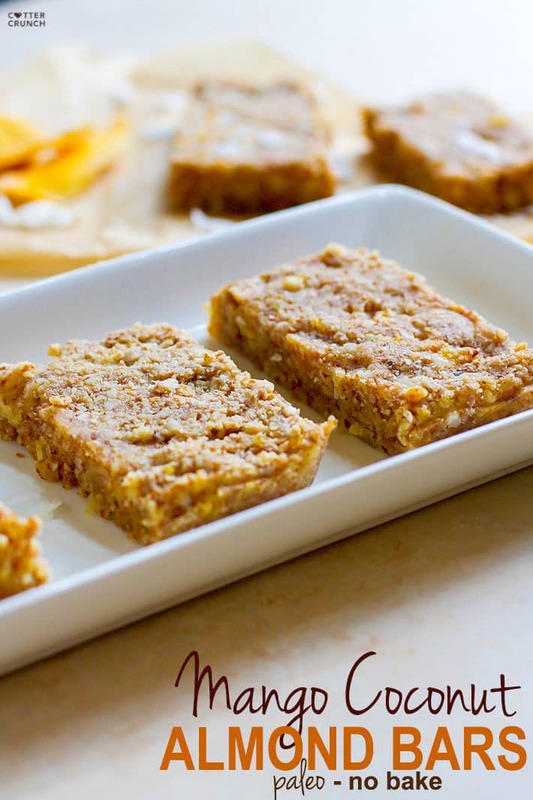 Mango and coconut…love this SUMMERY flavor combo!! Is it really fall soon? Yum! And such a great idea with the egg white powder! I have never thought of using that as a protein choice. Carly, you’d love these!! ??? Oh God! It looks so tasty. I want to have a bite right now. I used a square brownie pan. Let me know if you try! How much protein are in these bars? Are you using the egg white powder or other protein? I’ve only managed to find whole egg powder. Will this be ok or should I use one of the substitutes? 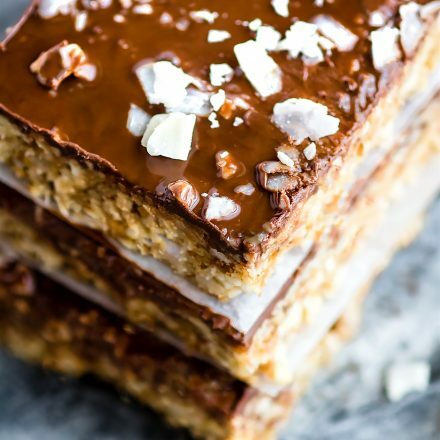 Planning on making these, just curious, is the nutritional information based off how many bars? Cause it says makes 9-12, so if you remember could you let me know? Thanks! I calculated these with the egg protein for 11 bars i think. KEep me posted! How do you grind dried mango? I grind in food processor or vitamix. Grind a little at a time. Does that make sense? you could chop them finely if need be. Do you think collagen will work instead of protein powder? which kind? I think it depends on the brand and type you use. I think if you mix it in last it might work! the one that doesn’t dissolve. Keep me posted! got it! well that will dissolve in the mix but I still think it will work! keep me posted. and feel free to use maple syrup versus honey. it should! I used a pea protein once before. Just might be a little different consistency. Keep me posted! This recipe looks exciting. Just wanted to know which variety of dried mango should be used as an ingredient as it is on of a crucial element? I buy the natural no sugar added dried mango. Hope that helps!